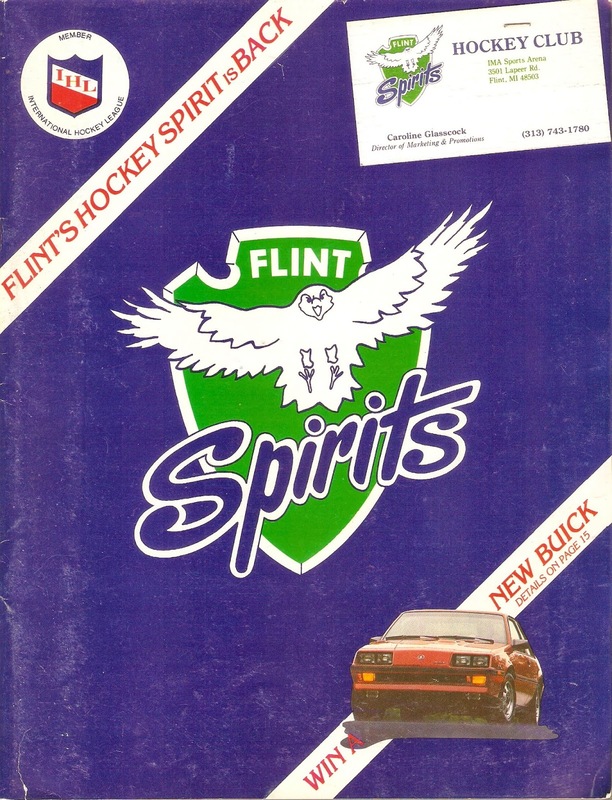 The Flint Spirits were an expansion franchise that joined the IHL late in the summer of 1985. Flint's previous team, the Generals, left for Saginaw in July after failing to come to terms on a lease for the IMA Sports Arena. The Spirits replaced them on August 6, 1985, a mere eight weeks before training camp! The Spirits were originally owned by Laraine and Carl Lamb. Former Red Wings great Ted Lindsay helped get the franchise off the ground as consultant, and suggested the Lambs hire Doug McKay as Coach/GM. 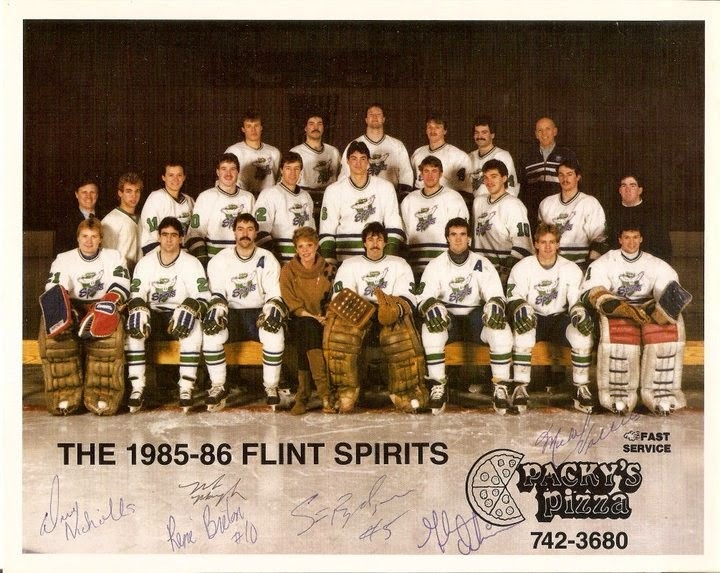 Due to the late start for the franchise, the Spirits operated as an independent club (no NHL affiliates). Doug McKay had success in the IHL before, leading the Kalamazoo Wings to two-straight Turner Cup Finals berths, winning it all in 1980. However, he would have no such success in Flint. His Spirits slammed head-first into the basement of the IHL, with a horrific 16-60-6 record. Their anemic 38 points were 20 points behind second-worst Toledo, 74 behind league-best Fort Wayne. Understandably, McKay couldn't build a winner on such short notice and with no NHL parent clubs. He had very little to work with, and his Spirits brought up the rear in both offense and defense. Flint scored just 270 goals, 23 behind second-worst Toledo. As bad as their offense was, the Spirits did have two forty-goal scorers on the roster. Jim Egerton led the team on offense, scoring 46 goals and 102 points. He also topped the team in penalty minutes, spending 226 minutes in the sin bin. Future Saginaw Wheel super-pest John Vecchiarelli was next with 40 goals and 92 points. There was a dropoff after that, as only Carmine Vani (traded partway through the season to Milwaukee) scored 20 goals that year. The Spirits were even worse on defense, allowing a league-high 495 goals, 74 more than (surprise!) second-worst Toledo. The team used five different goaltenders that season. Dave Parro and Michel Valliere took the brunt of the abuse, playing in over 40 games each. Parro went 10-34-0 with a 5.58 GAA. Dan Olsen, David Moffitt and Terry Kleisinger (a late-season pickup from Toledo) played in about 3-4 games each. coach like Doug McKay couldn't make this team competitive. Flint fans, irritated about the loss of the Generals and not impressed with the new club, stayed away in droves. To show how bad it was, the Flint Journal reported that two WWF house shows brought in more money than the entire 1985-86 Spirits season! The Lambs would eventually be bought out by a group led by Donald Chambers and former Generals star Bob Perani. Given a proper offseason to work with, the new owners cleaned house, bringing in former Sabre (and General) Rick Dudley as Coach/GM. This is the first Spirits program from that season I have seen online, and I grabbed it quickly. This is from early in their first season, only 12 games in. The original owner stapled a business card to the front cover. It's a pretty nice program. It's 60 pages, almost all black-and-white. There's a team photo of the 1969-70 Generals, asking fans to see how many names they could come up with. Then-Flint Mayor James Sharp welcomed the new franchise to town. Local ads include Buick, WSMH FOX 66 and WCRZ Cars 108 FM. One of the most interesting pages is the one that has all the nicknames submitted in the "Name-the-Team" contest. The names went from Acorns to Ziplomats. Plenty of auto-related names, and a few old IHL nicknames as well (Flags, Gems). There are even a few that would be used for future teams in Flint--Warriors and Bulldogs.